Figure 8 Seaweed farming integrated with abalone operations will lessen the pressure on harvesting wild seaweed (Ecklonia maxima) beds, close to their sustainable exploitation limits, in South Africa. Photo by M. Troell. rates at least as good as with artificial feed, can improve abalone quality, and reduce parasite loads. Ulva and Gracilaria are cultivated in the wastewater from the aba lone and one farm on the southeast coast currently grows most of its feed (4 tonnes per working day of Ulva) in shallow raceways (Figure 9). Seaweeds grown in abalone wastewater have an increased nitrogen content, resulting in value added seaweeds with over 40% protein dry weight content and, hence, of excellent quality to feed abalone. Figure 9 Shallow seaweed (Ulva lactuca, U. rigida, and U. fasciata) raceways receiving the effluents of the abalone (Haliotis midae) covered tanks (left) as source water at the Haga Haga farm, 70 km from East London, on the southeast coast of South Africa. Photo by R.J. Anderson. 100%) can be sustained for shorter periods. This can, of course, be optimized, depending on what the main objec tive is with re circulation. The re circulation through seaweed tanks/ponds also has the potential to raise water temperature, which can stimulate abalone growth in areas of cold coastal waters. 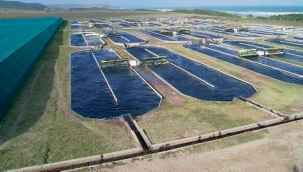 Compared to many other aquaculture operations, there is currently no real envi ronmental pressure from abalone wastewater release in South Africa. Wastes from abalone operations are differ ent from those of fish, with significantly lower concentrations of both nitrogen and phosphorus. This implies that the seawater in the seaweed tanks needs to be fertilized to sustain seaweed growth. 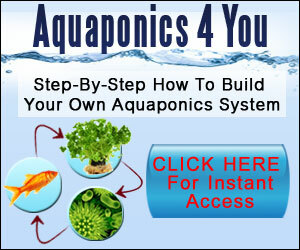 This additional input of nutrients would not be needed if seawater from fish tanks were to be used (this has been tested with success). 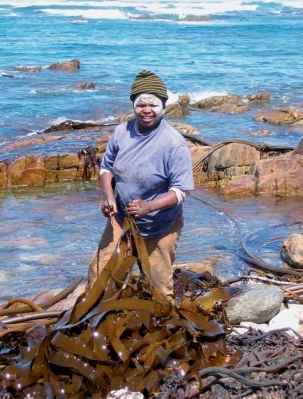 The development of IMTA in South Africa has, in fact, been driven by other incentives, such as future limitation of wild kelp harvesting and the proven eco nomic benefits from improved abalone growth and quality with seaweed diets.